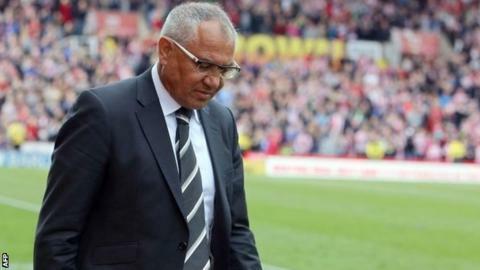 Felix Magath is not the right man to lead Fulham back to the top flight, says ex-Cottagers striker Rodney Marsh. Fulham's defeat at Stoke on Saturday, coupled with Sunderland's win at Manchester United, led to their relegation from the Premier League. The German, who took over in February, is Fulham's third manager this year. "They need the right man who can handle the rebound," Marsh told BBC Sport. "They need a Neil Warnock or Dave Jones, who have success at that level." Speaking on BBC Radio 5 live's Sportsweek, Marsh added: "Some foreign managers who get relegated are like deer in the headlights and don't understand what the Championship is all about. "In the lower leagues, the knowledge of the overall standard of play comes into play." Magath, 60, who won three league titles with Bayern Munich and Wolfsburg, took over from Rene Meulensteen, who himself replaced Martin Jol, signed an 18-month contract when he joined the club with 12 games to go. After Saturday's defeat, he said his players did not battle hard enough to keep their side in the Premier League. Jones, who guided Wolves to promotion from the Championship in the 2002-03 season, told Sportsweek that both Fulham and Cardiff had made a mistake by sacking their managers mid-season and replacing them with men who had no experience of managing in Britain. "Sometimes a chairman thinks it is best to bring in foreign coaches but look at the likes of Tony Pulis, Mark Hughes and Steve Bruce," he said. "They have done a fantastic job because they know the Premier League and what it takes and if you bring in someone who doesn't have that knowledge it can have an impact."